This small, fearless wildling we literally just brought home from the hospital turned three a couple weeks ago, but despite my certainty that we just got her, I won’t lie, this feels like a gazillion years ago because when did she not have hair. Strangers on the street often ask us about her hair, and I get it, I do. She’s small, it is big, and also red and with spiral curls going in every direction and there are three other members of our family and none of us have spiral curls or red hair. This isn’t the only way she’s already her own fierce little person. I was definitely not into dolls or dresses growing up, so I watch with awe as she plays for hours with her very pink baby doll, the doll’s stroller, the doll’s purse, the doll’s crib and high chair; when she comes home after being out all day, she likes to sit quietly with her baby on her lap on the sofa for a while to catch up and it is, objectively (I am known for my objectivity when talking about my kids), one of the cutest things I’ve ever seen. Of course, you do not need a cutesy cake pan to make this. You can make it as a single loaf or double it in a traditional tube or bundt. You also don’t need much time; I made this entire cake in under two hours and it goes even faster if you don’t have to cool it so the glaze stays in place. As a birthday cake after a big dinner, it was exactly right — not too heavy or sweet, but still cute as a button. It would be great for brunch or lunch this weekend or, you know, now. It’s Cake O’Clock somewhere, right? * I used the berry buttercream and sheet cake from The Smitten Kitchen Cookbook to make pink frosting on vanilla cupcakes. The cake, as written below, makes 1 standard loaf. To make it in the doughnut-looking pan I show, you’ll want to use 150% of the recipe (it bakes in 38 to 40 minutes). To make a bundt or tube cake, you’ll want to double the recipe (it will take anywhere from 45 to 60 minutes, as shapes range a lot). 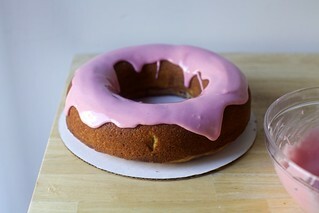 For the doughnut or bundt cake, I double the glaze. For the raspberries, fork-mashing is easier, but if you’re bothered by seeds or want the smooth appearance you see in the top photo, you’ll want to blend the berries and sieve out the seeds. For the glaze, you could make it with a spoonful of raspberry puree (for this, you’ll definitely want a seedless puree), you could make it with lemon juice, or a mix of both. Or you can skip it for a less sweet cake; it’s perfectly lovely with just a dusting of powdered sugar to finish. 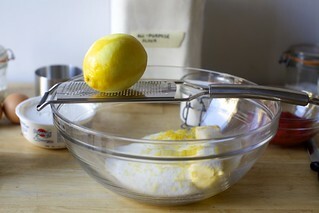 For a little more lemon flavor, you can squeeze that half lemon you use for zest and measure the juice (it should be 1 to 2 tablespoons), then use that much less sour cream in the white portion of the cake, adding them at the same time. Finally, a little shopping note: Around here, raspberries come from the grocery store in 6-ounce clamshells, which neatly provides the 1 cup (5 ounces) you’ll need for the pink portion of the cake and the last few you’ll need for a pink glaze. Heat oven to 350 degrees F. Coat a standard loaf pan (either 8″x4″ or 9″x5″, or any size between, will work here) with nonstick baking spray or butter, making sure to get into the corners. Place sugar and salt in a large bowl. Zest lemon into sugar and rub it together with your fingertips; this helps the lemon release the most flavor from it. 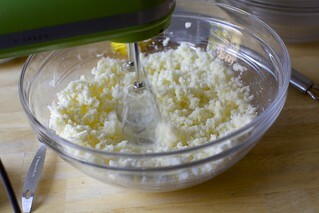 Add butter and use an electric mixer to beat it with the sugar until fluffy. Add eggs, one at a time, beating well with each addition. Scrape down bowl. Sprinkle cake surface with baking powder and mix it until very well combined. Scrape down sides of bowl again. Add 1 cup (only) of the flour and beat just until it’s no longer visible. 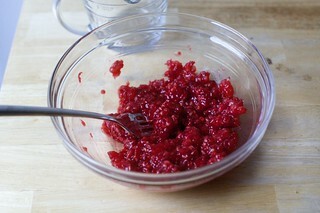 Place raspberries in the bottom of a second medium-large bowl and mash with a fork until mostly broken down but still a little lumpy; you’ll have about 1/2 cup mashed. [If you really dislike raspberry seeds and/or want a smoother look, you can blend the berries until smooth and press them through a fine-mesh strainer — into this second bowl — to remove seeds.] Pour half of the cake batter on top of raspberries (if you have a scale, you can zero out the weight of the bowl and raspberries; half the batter weights 277 grams) but wait, don’t mix it yet. 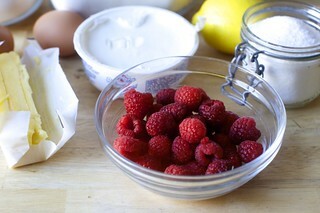 Beat the raspberries and second half of the cake batter together until smooth. Add final 1/4 cup flour, and beat just until smooth. Dollop batters in alternating spoonfuls into bottom of prepared loaf pan. Roughly “checkerboard” the rest in, meaning that you’ll drop a pink batter dollop and then a white one and vice-versa until both batters are used up. Drop your pan onto the counter a couple times from a few inches high, to help tap out air bubbles. Use a butter knife or small offset spatula to make a few figure-8s through the batters, marbling them together — but just a little, say, 4 to 5 figure-8s. Any more and the swirls may not look distinct when you cut the cake. Bake loaf cake for 50 to 55 minutes, or until a toothpick inserted into the center of the cake comes out batter-free. Let cool for 15 minutes in pan, then run a knife around cake and gently remove. 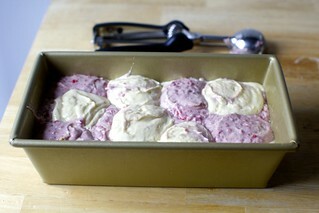 Let cake cool completely on rack (I hasten this along in the freezer) before glazing, if using a glaze. To make your glaze, place powdered sugar in a medium bowl and add raspberry puree (for this, it’s best if you press the berries through a fine-mesh sieve to remove seeds, or it won’t have a smooth pink look) or lemon juice. Whisk to combine, but it will almost definitely be too thick. From here, add milk, a teaspoon at a time, until you can whisk the sugar into a thick but loose glaze. Spoon on top of cooled cake and nudge it to the edges with your spoon or an offset spatual so that it drips where you’d like it to. Cover with sprinkles, if using. Cake keeps for 4 to 5 days in the fridge. If there’s no milk in your glaze, you can store it at room temperature. When you 150%-ed this cake, did you use 2 eggs or 3? I’m going to try this today with wild blackberries for a purple cake, can’t wait to see how it looks! It would be 3 eggs…math isn’t my strong suit though so I asked my engineer of an other half, and he told me 3. Then told me to stop asking him everything else and just multiply by 1.5. Please, please post a photo of your purple cake!! Thanks Deb – I love your homemade birthday cakes. Looking forward to Jacob’s, which I recollect comes next. Can this cake be easily made into a layer cake? I was thinking of using it as a birthday cake but in layers instead. Thanks!! It wouldn’t be my choice for a layer cake because it’s a pound cake, a bit more heavy than layers and frosts well. This cake looks so moist and delicious! Such a great summer dessert! Do you have the non stick or regular donut pan? I bought the nonstick but the regular is a much better value. So sweet.. when one of my grown up sons was 3, he refused to a pink crayon given to him in nursery school , and told the teacher that “pink is disgusting “. Who knew that 3 year olds needed title 9 training. Raspberries are never disgusting. We still have a long way to go. I hope EVERYONE enjoyed that super looking cake. We have…. roughly twenty-six pounds of raspberries in our freezer from our bushes. Any thoughts on how this might need to be changed to use frozen berries? 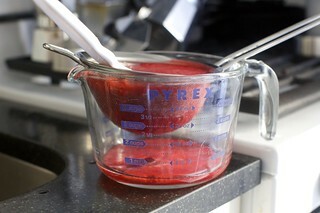 I have made raspberry purée or could from frozen berries in the winter (though from a bag, not my own … jealous). 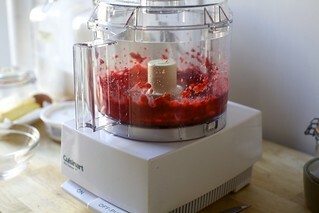 I usually just thaw the berries some so my food processor doesn’t have to work so hard. Otherwise, my guess is that it would be roughly the same…you would just need to weigh out 6 oz or approximate that amount. Frozen are fine. You’ll want slightly heaped 1/2 cup mashed berries for the cake as written. Yes, but I presumed frozen and defrosted are more collapsed so you may not need to start with a full cup. I did 5oz frozen berries x2 for my bundt and made a purée without seeds. It came out perfectly! I sent you pics and comments on IG. I realize now if I weigh things (especially when in doubt) I rarely have issues. Thanks for an awesome recipe for Valentine’s Day! If I had a dollar for every time I was asked if my toddler’s blond curls were “natural.” No, I didn’t send her out for a perm and she definitely wouldn’t sit through that sort of torture. Happy Birthday to your Anna from a mom of another Anna. Good name choice. Restaurant? You’re making cakes for a restaurant now?? She says they went out to dinner. Apparently took the cake along. I don’t know where my previous comment went but please let me know where you got Anna’s dress in the photo with her dad. Thank you! It’s from Hanna Andersson but from last year because it took her a whole birthday to grow into it! And thank you. Deb, you are truly incredible! How is it that every single one of your recipes looks so incredibly gorgeous that I want to make it immediately, and that every one I make is perfect! This one is no exception!! Perfection! This made me laugh since I was a red-haired little girl who until the age of 7 refused to wear anything except PINK ! My mum bought me pink jeans and boots.. Then all of sudden I refused everything pink and switched to blue. Kids are funny! Ooh this looks lovely! One note: I think you mean “creme fraiche” and not “reme fraiche” in the ingredients list :-) I always get excited to try your cakes because they are just up my alley of taste and texture! Your recipes are always so tasty!!! FYI your site was mentioned on the new season of Orange is the New Black! Yes – I heard the mention too. How cool!!! I made this yesterday as a donut blackberry “purple” cake using wild blackberries and it turned out perfectly. My pan is not non stick so I made sure to butter and flour it thoroughly and had no issues with sticking. I upped the amounts 150% as suggested but I forgot to increase the amount of berry puree accordingly. However, I didn’t notice any serious ill effect, though the berry flavor could have been stronger. I also only had to bake mine for 30 minutes. This was a huge hit at a barbecue today and I will definitely make this again! Also, is there a good way to make this without the lemon? I have weird acid reflux that can handle the raspberries just fine, but not even that amount of lemon. You can skip the zest and it’s optional everywhere else. Your posts usually bring a smile to my face, but this one especially so. Happy Birthday to Anna, and what a lucky girl she has to have such a wonderful mom. oh, this sounds lovely and looks stunning, too. Thanks for sharing your recipe! Happy birthday, dear Anna. Beatrix was just wearing that Hanna Anderson dress with the pink top and striped skirt this weekend. A hand-me-down from her cousin, I think. Poor kid only gets hand-me-downs. And she didn’t even get a birthday cake from us this year because our June was too busy. Cupcakes from the grocery store with her Toddler Class. Aw. It’s, in fact, her 2nd birthday dress (which I’d just bought as a dress and once I realized it had shiny ribbons and a lining, it became her party dress) but it finally fits right. And so in 10 seconds it will be too small. I too am a redhead with natural curl. Strangers would comment on it so often that my straight haired brunette sister (who is much cleverer than I!) suggested that when people asked where I got my hair, I should reply that “it was a K-mart blue light special.” We thought it was hysterical as kids. Now that I’m pushing 50, people would believe me. Being a curly redhead has it’s perks, but ginger bullying is real, so buckle up. She is such a cutie! If you were making this for someone who prefers vanilla to citrus, how much vanilla would you use? Skip the zest, add some vanilla bean to the sour cream portion. I made this for my daughter’s 7th birthday party, and it was both beautiful and delicious. Doubled the recipe (for the cake only — single batch of glaze was sufficient) and made it in a bundt pan. It took 1 hour and 10 minutes to bake. I didn’t have lemon so I used vanilla bean paste in the batter. Pink and sprinkles! And raspberries! What’s not to love?? Gosh that is super stunning and I just kept looking at the image for so long, raspberries being one of my fav berries. Am I reading correctly that all of the sour cream gets added to the “white” part of the cake batter? Also, this part of the instructions is confusing, “Beat the raspberries and second half of the cake batter together until smooth. 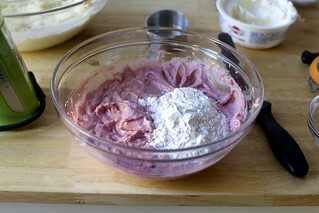 the raspberry sauce into the other half of the batter until combined.” Thanks for clarifying! You are reading correctly. I used more bowls than usual, worked slowly, read and re-read before each step. It’s worth slowing down for. I did it with a four year old at my side, asking questions, so I REALLY had to read carefully and repeatedly. Oops, it is confusing, just a stray half-sentence, now deleted. 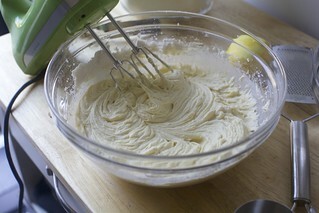 It’s basically this: Divide the batter. Mix sour cream into one half. Raspberry sauce into second half. Both halves get a final 1/4 cup of flour at the end. The instructions are a little exacting because I made this cake so. many. times. that I kept picking up more shortcuts, like if you beat the “white” part first, you can reuse the beaters; and if you mash the raspberries right into the bottom of the bowl, you only need one bowl. Etc. I mostly just hate washing dishes. Thanks for the clarification! Made the cake as a loaf. Flavor was delicious, but as others have commented the texture was a bit dense and it deflated a lot after cooling. Maybe needed another 5 min of baking? Also, I found the marbeling difficult to achieve – had more of a half and half effect than the beautiful marbling in the pictures. Dear Deb, on top of all the different varieties you have given us here, I would like to know whether you think this could work in cupcake format? Thinking about making these for my daughter’s kindergarten class when she celebrates her 5th birthday (no way!!) next week. Thank you so much! I don’t love these for cupcakes because a pound cake is a bit heavy for cupcakes. Oh man, I never reported back and that is so rude of me! So, I made them in cupcake format, and did not bake them for very long (~15min) and made that glaze and we decorated them with little sugar pirates (storebough) because my girl wanted a girl pirate party and they were really tasty and a huge hit at her kindergarten with both kids and teachers! Anna is beautiful. I can’t stop looking at her eyelashes in the photo with Alex. The cake is so cute and sounds delicious. Just made this for my 4 year olds birthday today! Delicious, and better than the Starbucks inspiration. Why the sour cream in the white cake and not the pink? I messed that up. Also I did 1.5 the icing, way too much. The sour cream and raspberry are swaps for each other. It’s not needed with the raspberries. Hi Deb! What brand of sprinkles are you using here? Love the varied lengths and color range. They were a gift, I think they’re a blend from Sweetapolita. Hello Deb! This is a crazy question on a food blog, but my daughter loves baby dolls too and I have no idea how to find a good one. What kind does your daughter love? She wants a plasticky one, but I dont want it to be junky. Also this cake looks deliciously amazing! She doesn’t have a preference (we didn’t shop for one or anything) but her aunt bought her this when she was a year old and she hasn’t put it down since. I swapped it with a new one when it was looking pretty dirty; she didn’t notice (phew). I made this! But my loaf deflated to about half the height while it was cooling in the pan, on a rack. Any guesses as to why? Still tastes delicious! Just a little dense. No, sorry to hear. I never had any sinking (in the 5x I made this). This is so cute, pink is my favorite color too! I like how you included adjustments to the recipe to make it less or more sweet! I bet she loved it, I know I would’ve! This was delicious, pretty and easy to make. I cut the sugar by 30 grams but could cut it more still, it was sweeter than we prefer. I served it for my 5 year old’s birthday with whipped cream, raspberry whipped cream and the leftover puree. I use a bag of frozen raspberries instead of fresh. I did small dollops so didn’t need to do figure 8s to get the marbled effect. My four year old and I made this together for his birthday today. It turned out great! We used strawberries instead of raspberries and made a cooked purée with lemon and sugar. We also doubled the lemon zest and used whole wheat pastry flour. The cake is delicious and tastes like strawberry lemonade. My grandson and I just made it, in the Bundt pan, with Gluten Free Girl’s flour mix (that I make myself). It took just over 60 minutes to bake, and turned out beautifully. I have found that using her flour ratios in your cake recipes, with no other modifications, turns out cakes that are perfect. No one guesses that they are gluten free. The most important tip is to measure the flour by weight, which you thoughtfully provide. Josiah is thrilled with his pink donut cake! Thanks for another fun recipe. I can not find the recipe for the pink butter cream frosting ! Can you help? It’s in my first cookbook, The Smitten Kitchen Cookbook. Great tasting and fun cake. The technique of reserving some flour to finish/adjust the two batters is smart. I did not need any milk to thin the icing. Made this for a Monday morning financial meeting. It got lots of compliments and set a lighter tone for the conversations. No sprinkle haters here. Perfect timing! I have an overabundance of ripe raspberries from the garden and this looks like a great way to use some. 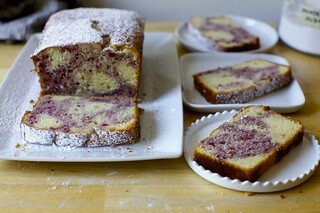 If I wanted to make this as an all raspberry-lemon loaf (rather than a half-n-half marbled loaf), with extra lemon flavor, am I correct in thinking that I would double the amount of raspberries (reduced just a bit to the extent any squeezed lemon juice gets added) and skip the sour cream entirely? Will I miss not having that tangy sour cream richness though?? And lastly I should beat in a 1/2 cup flour at the end (rather than the 1/4 cup added to each half of the batter in the marbled version), correct? Am I missing anything? Looks like it’d be delicious no matter what! Yes, you’ve got it right. You’ll be fine without the sour cream. Doubling the recipe worked perfectly in my Nordic Ware Heritage Bundt pan with a baking time of one hour. I made this last week and it tasted great but the texture was a bit confusing. I removed the seeds from the raspberries and then used 5oz. of puree in the batter. The raspberry half of the batter was much thinner than the sour cream/white half. 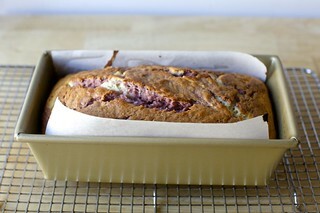 This made the texture of the raspberry pound cake softer then the white part when baked. Should I have measured 5 oz. 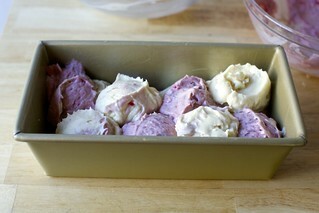 of raspberries and used the puree from that instead of 5 oz. of puree weighed after removing the seeds? One more question, would this freeze well? 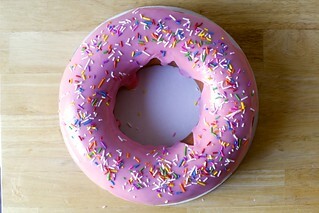 Could I glaze it and then freeze or glaze after I defrost the cake? Thanks for your help! This cake is so cute to look at. I just have to make it for my nieces baby naming this weekend. Made this last night. Loaf deflated to about half size after cooling for 10 minutes. Not sure where I went wrong- overmixed, opened the oven door, too short baking time? Flavour was good but way too dense. I normally have great success with Deb’s recipes but this was a straight up fail for me. Sorry it gave you trouble. I made it so many times as written, I presumed it was more failproof than any other recipe. Any other variables to consider — are you at an altitude? Any ingredient swaps or adjustments? I don’t thinking mixing the raspberries into the cake batter made a big difference to me — I must not have incorporated them into the batter well, as they’re just pockets of smashed raspberries. Still tasty, maybe not as special. Definitely going to try this recipe. I am allergic to dairy so I’ll definitely sub out the ingredients for dairy free ones. It looks amazing and the step by step guidelines are super helpful. great recipe. Cant wait to try! Like your little one, I also love anything pink and this cake is adorable!! I hope she had the happiest birthday! Sprinkles! 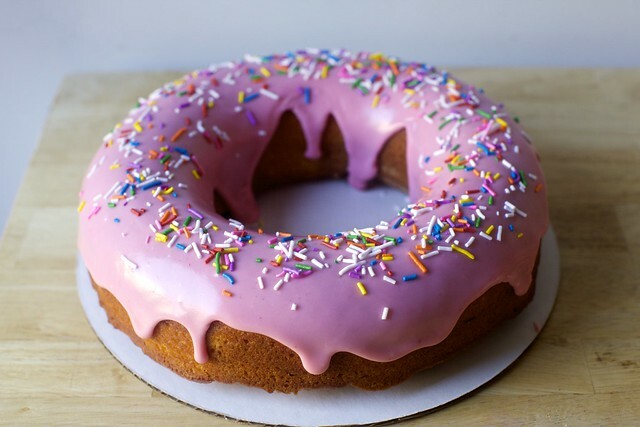 This looks so good, just like a giant donut. Yum! I made this last night with plain Greek yogurt for the dairy. It is very delicious, but maybe I’m just sensitive to raspberry seeds, or my berries are very seedy? I feel like the seeds sort of ruin the raspberry portion of the batter. :( I would love to try again, sieving them first next time. Otherwise, a definite winner! I made this twice – the first time I doubled the recipe and baked in a bundt pan and the second time 1X in a loaf tin. Both times, the cake fell by half when cooling and the texture was way off, much too dense (same as some of the other comments). I made no substitutions or changes to the recipe, live at sea level, and use a scale. I also use Gold Bond flour. I’m wondering if the batter is too moist? I felt like the raspberry mix was a lot looser than the sour cream. Is 2 tsp baking powder too much leavening agent? Could it make a difference that I use cane sugar that’s a bit more coarse than regular granulated? First time I’ve had a miss with an SK recipe. Flavor is amazing though. I just made this for my daughters birthday and had the same result. Doubled for a bundt pan, weighed ingredients. Others comments made me nervous but I was hopeful. First SK fail. It sure was beautiful! And the flavors delicious, but fell quite a bit and super dense. If I’d baked any longer the outside would have been overdone. I just found your site and I’m loving your recipes. You have great pictures! This is on my list of recipes to make, it looks delicious! I made this last night and the flavours were so great but I got a really poor rise, and ultimately it ended up underbaked even though the sides were really dark and a skewer came out clean :( I wonder if adding a half TSP of baking soda would help the rise a bit? (Since there is so much acid in the cake?) I think I am going to have to throw out the rest of the loaf because it’s undercooked which pains me! I will try it again sometime but will use my thermometer over just a clean skewer, and add a bit of soda. I would add too that the general recipe is really similar to cakes I have made a million times (it’s more or less a jazzed up yogurt cake, no?) And have always turned out and been super fail proof so this was extra surprising to not work out. I wonder too if maybe my baking powder is near the end of its life. Looks yummy, I am going to give it a try. I got also answer in the comments too. Thanks All. Can I adapt to make in a bundtlette pan? Do you think that’s possible? I will make you on Sunday and if it turns out OK, I will tag you on Instagram :). Is there a reason that the baking powder is added separately from the rest of the dry ingredients? Yes. I do this to one-bowl the cake. I want to make sure it’s very very well-incorporated without over-mixing the flour to do so. Delicious! I realized about 1/2 way through that your directions are specific to a hand held mixture. Using a kitchen aid, I would change things up since I only have one bowl that works, so not having to clean the beaters becomes irrelevant. For the bowl with the raspberries, I just mixed with a wooden spoon.